We offer Capoeira classes and private lessons to students of all levels and ages. Students learn the basic techniques from attacks and defense, to advanced strategy and acrobatics while building strength, stamina and flexibility. Our Capoeira classes offer a full body workout that combines martial art fitness, dance, rhythm and a lot of playfulness. $60 / 4-Class Beginner Pass / 1 month exp. $190 / 10-Class Pass / 3 month exp. Capoeira is a full body workout. Classes begin promptly 10 mins past the hour. After a warm up, students practice drills in a line up, across the floor, or with a partner. 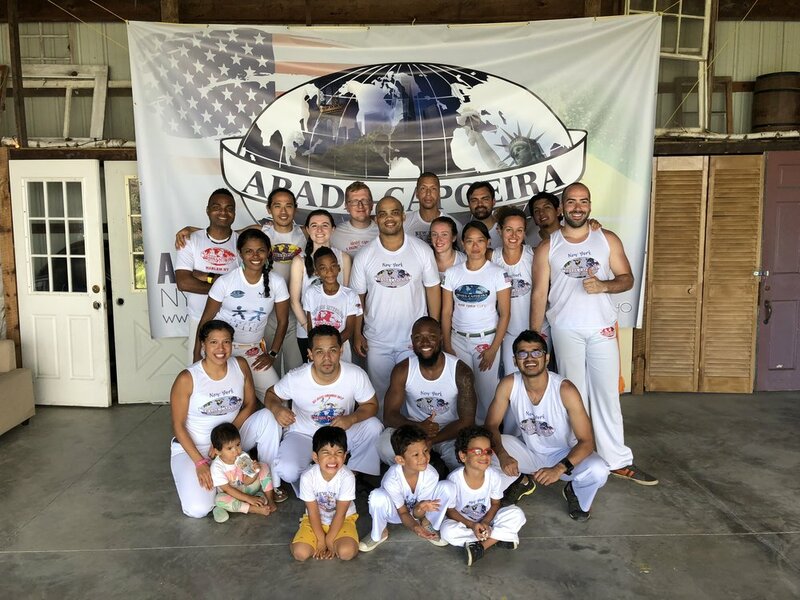 Classes usually end with a roda ( pronounced Ho-da) where students take turns playing Capoeira with each, while the other students bring energy to the game by singing, clapping and playing traditional musical instruments. Adult classes are split into 2 sessions of 50 minutes each. The first session offers beginners extra attention on basic techniques as well as drills for mobility, coordination, and strength. The second session (also open to beginners) continues with more advanced technique, partnered training and music. Some classes may warm up with Maculelê, an Afro-Brazilian dance traditionally performed with machetes, but now performed as a "mock stick combat". Dancers hold two sticks in their hands while they are performing, striking their sticks together and making expressive and athletic dance movements. We suggest first time students attend both sessions in the Introductory offer to familiarize themselves with Capoeira. After the intro offer, beginners can take the first session until they feel ready to participate in the 2nd session as well. Beginners should wear comfortable workout clothes that allow for free movement and make you feel like a super hero. No shoes or socks in class. To sign the electronic waiver, please use a device that has a camera. If you are on an iPhone or iPad, please switch to the Safari browser.